Changes in the Western diet over the last century have led to a decrease in the general consumption of omega-3 fats, and an unhealthy increase in the dietary ratio of omega-6 to omega-3s. 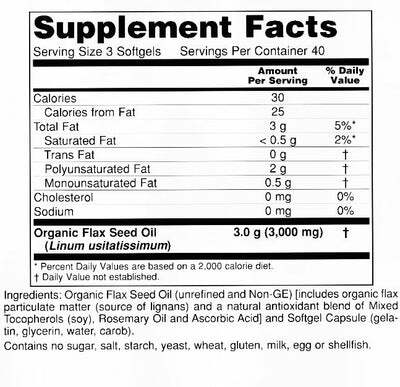 The essential omega-3 oils in Flax Oil are often known to benefit cardiovascular health, support healthy cognitive function, and help maintain a healthy inflammatory response. Flax oil is frequently used to help alleviate symptoms of constipation and to maintain gastrointestinal health. Flax Seed oil is a source of alpha-linolenic Acid, an Omega-3 Essential Fatty Acid, which is believed to decrease inflammation and is often used to help relieve pain associated with inflammatory-based injuries or medical conditions.